Illinois, United States (LRMC) – As student protests continue at high schools across the United States, they’ve been met with responses ranging from liberal support, right wing condemnation, and quite a mix from the left. The reasons why rest in the issue at the forefront of the actions happening nationwide: gun control. But is this the only demand of the students? Regardless, critiques of Democrats attempting to use these kids as political props are well-founded. Democrats attach themselves to any popular social action in order to gain electorally, though the track record of Democrats and liberals supporting a movement through to any system-shaking ends is going to leave many wanting. They don’t call the Democratic Party the “graveyard of social movements” for nothing. Conservatives and right-wingers, tiring of their up-is-downism, seem to be over the fight for free speech as they could not be less impressed with “skinhead lesbians” demanding action on guns after losing 17 schoolmates. One of the main issues for the left is the danger of rushing into gun legislation too quickly and its impact on students and communities of color. Democrats and liberals seem very intent to overlook this appeal to the state and the adverse effects of law enforcement in the United States. The bottom line here is that law is not enforced equally, nor has it ever been. The state is not a neutral purveyor of justice. Not on the same level as disparaging survivors of a massacre, doubt continues to be cast over how genuine these students are given that their prevailing demand is so closely aligned with the Democratic agenda. No doubt that the Democrats aren’t being honest in their interaction, but, again, is gun control all that these students are after? The only demand that these kids have regarding guns is to keep them out of schools, which makes perfect sense statistically speaking. Despite the traumatic nature of school shootings, and highly sensationalized media coverage, schools are safer than they’ve ever been. According to the Washington Post, the odds of dying in a school shooting are less than1 in a million. 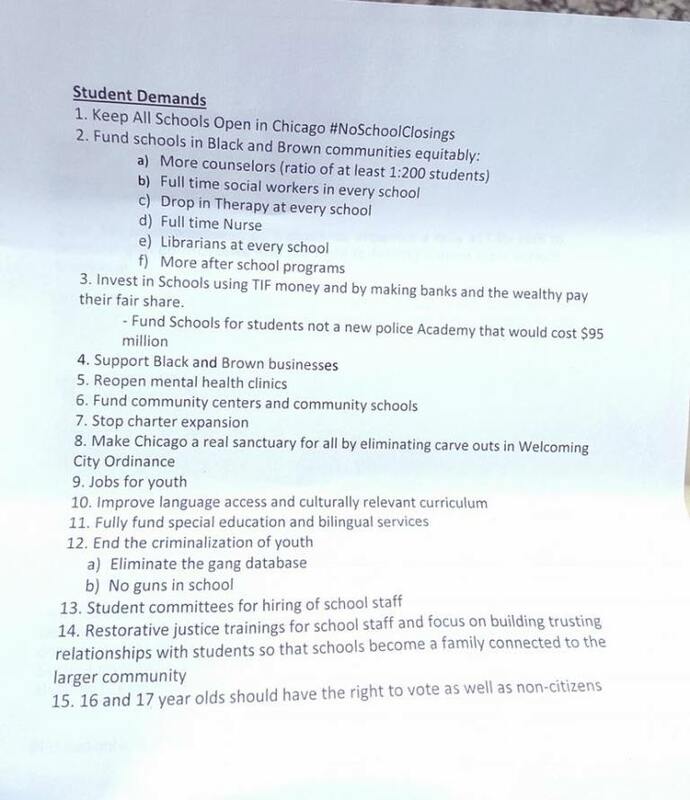 Also of note, there is nothing among the demands which calls for more cops in schools. The data on that, since the Columbine shooting in 1999, has proven to be a disaster with over a million students arrested, mostly of color. In that same article from the Washington Post, it becomes clear that one of the effects of cops in schools is that, because of the lack of violent crime in schools, they pursue nonviolent offenses far more harshly than they would be handled by school administration. On the topic of administration, they’re more likely to refer students to SROs (school resource officers) for behavior issues, creating a more punitive school experience overall according to an ACLU study. The crimes? Kicking trash cans, sagging pants, and even attempting to charge a 13-year-old with a felony for using a fake $2 bill for lunch. In fact, there’s a demonstrated preference that the $95 million intended for a new police academy be given to schools instead which illustrates that for this group of students, at least, there is a level of consciousness about safety in schools that rises above the confines of the dialogue we’re hearing on major news platforms and from the mouths of career politicians. Many students in the Chicago area are supportive of the #NoCopAcademy movement. Among the slogans of the Chicago Teachers Union is “broke on purpose” about the state of public schools in the city. It would seem that the students that developed this list are more than vaguely aware of that rhetoric. These demands themselves take far more aim at structural inequality, austerity in the public space, and the plight of communities of color, not the Second amendment rights treasured by white Americans. Interestingly enough, the demands are reminiscent of the platform of the Movement for Black Lives, not that it’s a issue-by-issue copy, but that it addresses the ways that politics, economics, and institutions create the problems society seeks to reconcile. Instead of harsher penalties for crime, or reliance on the police (read: the state), these platforms suggest that community, not punishment, is the way forward. Of course, this is just one group of students from one city. The argument isn’t to suggest that the dominant narrative is being suppressed, but that the diversity of opinion under the umbrella of student action is being underreported. What they’re arguing for may not be perfect, but it shows that more thought has been put into this than they’re getting credit for. “Their demands go far beyond gun control,” he noted. “This didn’t come out of the blue. 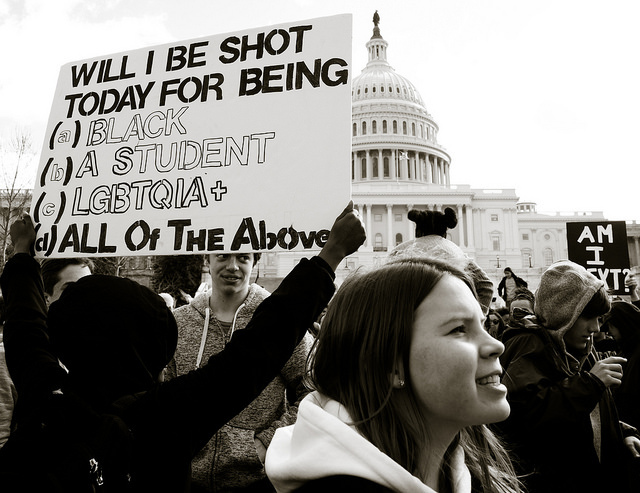 These students are coming out of the context of the Black Lives Matter movement. In Chicago, young people have created a context where Black Lives Matter is not just a movement against police violence and brutality. It is a movement for decent schools, to establish mental health facilities and to abolish the police academy,” Ayers explained. This leaves two remaining questions: How popular are these sentiments currently? How far could they go? One might hope that this institutional look spreads, and instead of reaching for the most politically viable target in guns, the students break rank from Democrat opportunists to address long-term strategies addressing the factors which cultivate violence in US society such as poverty, toxic masculinity, gender policing, homophobia, white supremacy, police forces, the military, propertarian land ownership norms, manufactured scarcity, privatized healthcare, capitalism, food insecurity, homelessness, addiction, and desperation. This is up to the students, though. It’s their moment. They deserve more credit and more space to discuss strategies toward an unwritten future.